Editor’s Note: This is Part I of a three-part series. Ellen Endo is a 2012 National Press Foundation Alzheimer’s Fellow. Credit for what scientists know today about Alzheimer’s belongs, in part, to a decades-long medical study of Japanese Americans. With little fanfare or national recognition, the Honolulu Heart Project (HHP) was launched in 1965 by the Kuakini Medical System and became one of the first to compare cardiovascular disease, high blood pressure, strokes, and cancer among those of Japanese descent in Japan and the U.S.
A total of 8,006 men volunteered, all born between 1900 and 1919 and ranging in age from 46 to 65. Most were veterans, having been identified through World War II Selective Service files. By 1991, the youngest of the HHP participants were age 72, and the research was directed more toward age-related diseases such as Alzheimer’s, vascular dementia, and Parkinson’s. The program, titled the Honolulu-Asia Alzheimer’s Study (HAAS), involved 3,468 JA men. Objective: To examine, among other things, why Alzheimer’s was relatively rare in Japan while vascular dementia occurs more often in Japan and among Japanese American elderly. Evidence obtained through autopsies, the only sure way of diagnosing Alzheimer’s, revealed startling evidence that the majority of JAs in the study suffered from mixed dementia. The most common mixed dementia occurs when abnormal protein deposits associated with Alzheimer’s coexist with blood vessel problems linked to vascular dementia. “This is probably the most important finding to come out of the research,” stated Dr. Helen Petrovitch, a HAAS principal investigator, in an interview with The Rafu Shimpo. 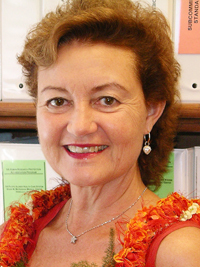 Petrovitch serves as executive director of the Pacific Health Research and Education Institute in Honolulu (PHREI) and is a clinical professor at the University of Hawaii John A. Burns School of Medicine. Researchers autopsied the brains of 426 JAs who had been, on average, 87 years old when they died. About half had been diagnosed with some form of dementia, typically Alzheimer’s. Among those whose brain lesion profile did not confirm an Alzheimer’s diagnosis, other forms of dementia were uncovered, including vascular dementia, Lewy body dementia, generalized brain atrophy, and a range of non-specific forms. “Roughly half of those who had been diagnosed with Alzheimer’s before death did not, in fact, show evidence of the right degree of brain lesions to support the diagnosis,” said study author Dr. Lon White in a report to the American Academy of Neurology last year. “Unfortunately, not many of the original (HAAS) participants are left,” Petrovitch said. About 500 remain, with the youngest being 93. Early in the HAAS program, two percent of the men ages 72-80 were diagnosed with dementia. By the time the group reached ages 85-93, as many as 33 percent showed signs of cognitive impairment. These percentages were higher than study participants in Japan butsimilar to Europeans and Caucasian Americans. Shortly after the HAAS program began, another study was announced in King County, Washington involving 1,836 JAs — the Seattle Kame Project, a collaborative effort of the University of Washington and the Seattle JA community. Mean age of participants in 1992 was 71.8. All were dementia-free when the project began. Funded by the National Institute of Aging (NIA) and directed by Dr. Eric B. Larson, the Kame Project studied the overall rates of dementia in 1,985 Japanese Americans. Between 1992-94, 107 persons (6.3 percent) met the criteria for dementia or Alzheimer’s. The Cognitive Abilities Screening Instrument (CASI) was administered every two years and was also used in Hawaii and Hiroshima. Increasing dramatically with age, the numbers were 30 percent for persons aged 85-89, 50 percent for those 90-94, and 74 percent for persons 95 and older. Rates were somewhat higher than Japan, which today continues to show lower incidence of Alzheimer’s, and similar to Caucasian populations in North America and Europe. Kuakini is continuing to provide some support to study the HAAS participants’ offspring although the National Institute of Health funding is running out. New funding opportunities are being sought. Earlier this year, the first-ever National Alzheimer’s Plan was announced by the Obama Administration, mandated by the National Alzheimer’s Project Act (NAPA) passed unanimously by both houses of Congress. Among other provisions, the plan commits $50 million in research funding in 2012. Another $100 million has been requested for 2013 for additional research, public awareness, provider education and outreach, and caregiver support. “Members of the generation who came of age during World War II, the so-called Greatest Generation, are now in their mid-to-late 80s and older. And more than one in three has Alzheimer’s disease,” observed Dr. Guy Eakin, vice president of scientific affairs at the American Health Assistance Foundation. “The post-war Baby Boomer generation also is confronting Alzheimer’s directly, as caregivers for their parents. The first wave of Baby Boomers is now reaching age 65 at the rate of one every eight seconds. At that age, one’s risk of having Alzheimer’s doubles every five years,” Eakin noted. As people live longer, particularly in developed countries, they are more likely to experience age-related dementia. For Japanese Americans, with a 65-plus population more than 50 percent larger than the majority U.S. population, the clock is ticking faster. 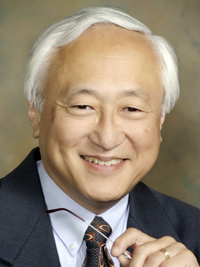 In the late 1990s, businessman and philanthropist George Aratani was among the first to recognize the impending “silver tsunami,” a time when the burgeoning population of Japanese American senior citizens would require programs adequate enough to treat age-related cognitive diseases. He persuaded the Keiro Senior HealthCare leadership to create and equip a unit devoted to patients with Alzheimer’s and dementia. Shawn Miyake, Keiro’s president and chief executive officer, recalls that there were those who doubted whether such a unit should be a priority for the senior care facility. Fortunately, according to Miyake, the same individuals also knew from experience that Aratani’s instincts are usually correct. In 2002, Keiro opened a state-of-the-art memory unit that has served as a model for the care of individuals with cognitive disorders for the last decade. Today, the unit is filled to capacity. Treatment and understanding of Alzheimer’s and dementia has advanced, and the time has come to update the memory unit, states Janie Teshima, Keiro Nursing Home administrator, who has helped guide the unit since it was first created. In addition to understanding the scientific aspects of the cognitive impairment, patients and their families often find themselves dealing with the stigma of the disease as if it were a mental illness. In Japan, many still falsely believe that a stroke is the result of working too hard, while dementia befalls those who have been lazy. While there are no national statistics as to how many JAs suffer some form of dementia, more and more parents, siblings or other beloved family members are experiencing debilitating memory loss. Coupled with the fact that their over-65 population is 40 percent larger than the general population, JAs are facing age-related issues at a rapid rate. For Japanese Americans and, indeed, all Americans, the tragedy of dementia is personal and imminent. How we cope with the challenges of the disease will be determined by how much we know and how we apply that knowledge. Thanks to a group of intrepid Japanese American men, the medical community knows a great deal more than it did in 1965.